Ooty The Queen of Hill StationsImagine being amidst the best of natural settings, trying out adventurous sports and spending some relaxed time with your loved ones all at one place. You can all these and much more at Ooty, the "Queen of Hill Station". The hill station presents a picture of perfect vacation that we all all dream of. With mesmerising scenery, breath taking tea gardens, fine pine and eucalyptus trees along with magnificent mountains around, Ooty tour offers a refreshing setting to spend few special days of your life. 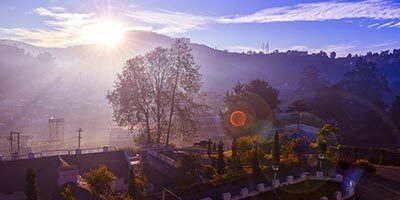 Trip to Ooty makes for a complete tour package with excellent accommodation facilities, well connectivity with rest of the country along with a pleasant atmosphere. However for a wonderful vacation, one needs not just a good destination but also an efficient tour plan. There are many aspects related to Ooty trip which need to be take care of well in advance. Ooty Travel, an important division of Holidays DNA assist tourists in planning their tour to Ooty in the best way possible. With the help of our experts we offer you with updated information on on each and everything related to the hill station varying from accommodation in Ooty to Ooty climate to places for sightseeing to sports options on the hill station, etc. We at Ooty Travel helps you in making an informed decision. Situated at an altitude of 2286 m in the Nilgiri District of Tamil Nadu, Ootacamund (Ooty) is also known as Udhagamandalam. The name of Ootacamund has been derived from the Toda word "othakal-mund" which means "the house of single stone". Unlike many other tourist destinations, the hill station of Ooty doesn't boast of historical connections. Although, one can connect it to Tipu Sultan because of the hideout cave which was constructed so as to extend the border of Sultan's empire. This is apparently the only recorded historic evidence of the hill station. Not just a popular tourist destination now, the place was a popular unwinding spot even in colonial eras during British rule and was also the summer capital of the Madras Presidency along with many other small kingdoms. The land is originally a tribal area which has been occupied by the Todas and other tribes, co-existing through trade and specialization. Toda Huts, which are a major tourist attraction can be spotted easily in Ooty. As you enter the hill station, you will be greeted with lush greenery, beautiful tea gardens, pine and eucalyptus trees and enchanting mountain. If you are thinking, the hill station has only nature to offer you, you might have to rethink. The hill station pampers its tourists with mouthwatering chocolates and local wine. Ooty's homemade chocolates and its local wine from the vineyards makes for an interesting gifts to take back home. The hill station is famous for the "English vegetables" and "English fruits". Vegetable and fruits such as cabbages, peaches, plums, pears are grown locally and are popular of their high quality, making for an important part of town's economy. Ooty tourist spots present interesting options for sightseeing. Located at an altitude of more than 2,623 meters, Doddabetta Peak presents its visitors with breath taking view of the valley and area around. Ooty Lake which is in the shape of L is located in the the heart of the city and makes for a good picnic spot. Tiger Hills, located towards the lower end of the Doddabetta peak is also a beautiful place to visit. Once in Ooty, you can't afford to miss visiting Ooty Botanical Garden. There are many more places in and around ooty that are worth visiting. Some of these are Coonoor (Dolphin's Nose, Hidden Valley, Ketty, Wellington's Golf Course, Sim's Park, Lamb's Rock, Law's Falls, Second World War Memorial Pillar), Red Hills, Bellikal (Kalhatti Falls, Bison Valley, Bellikkal Lake). Along with sightseeing in Ooty, tourist will have various kinds of spots to engage themselves in. out of all the outdoor activities, trekking is one of the most popular. The hill station has several trekking routes varying in distance, altitudes and terrain. One can also opt for other activities such as hang-gliding, angling that includes Goad Trout, Carp and mixed water. Toy train is an integral part of Ooty tour. Toy train that connects the hill station with Mettupalayam, makes holidaying in Ooty all the more enjoyable. Running at a speed on 33 kms per hour since 1899, the train covers a distance of 46 kms. In this close to 4 hours of the ride, the train offers travellers with long stretches of rice fields, lofty hills, 13 tunnels and 26 viaducts. It offers good photographic opportunities as well. The climate in Ooty is mostly pleasant and thus one can plan a visit at any time of the year. However, it is advisable to avoid visiting the hill station during heavy rainy days in monsoon season. Visiting during the annual Tea and Tourism Festival is likely to enhance entire Ooty experience. Reaching Ooty is not a difficult task. The hill station is well connected to the rest of the country. One can opt any of the three modes of transportation-roads, railways and airways based on his/her preferences and budget. The hill station of Ooty is approximately 535 km away from Chennai, 105 km away from Coimbatore, 18 km from Coonoor, 155 km away from Mysore, 187 km from Calicut, 290 km from Bangalore, 281 km from Kochi and 236 km from Kodaikanal. By rail the hill station is connected to many cities. Mettupalayam which is 47 km away from Ooty is the nearest major railway station. There are regular train services from Mettupalayam to Coimbatore and Chennai. You also have toy train from Mettupalayam and Conoor to Ooty. The hill station is on the National Highway 67 and thus connected by road to the the states of Tamil Nadu, Kerala and Karnataka via the five main accepted Nilgiri Ghat Roads. Coimbatore which is 105 km from Ooty is the nearest airport. It is connected to other cities of the country such as Chennai, Bangalore, Madurai and Hyderabad. 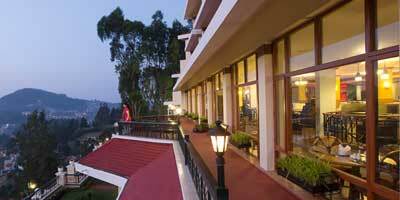 Accommodation in Ooty ensures you enjoy your vacation in a hassle free way. There are umpteen number of options catering to varied kinds of needs and budget. From luxurious to budget ones, tourists have enough options to choose from. Some of these are Sedgemore Wells, Preethi Palace Hotel, Hotel Blue Bird, Sterling Holidays Fern Hill, King's Cliff, Holiday Inn Gem Park, Club Mahindra Danish Villa, Hill Country Holiday Resorts, etc.